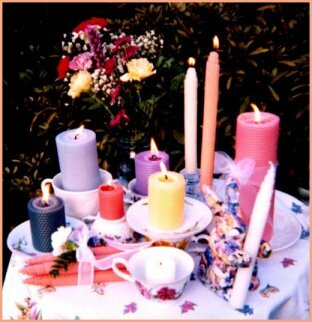 Moon Mama Candles are hand-rolled beeswax candles with an elegant touch. Our "Sparkling Fairy Dust" candles have been called "too pretty to burn" by many buyers but we encourage you to enjoy their clean-burning flames. Our tapers are spiraled at the top for a polished look. Each candle is packaged in cellophane and is finished with a hand-tied bow and gift card. We even offer personalized gift cards for special occasions! Most of our candles are pure beeswax, but some colors are a combination of beeswax and paraffin. Both waxes burn cleanly with no smoking or dripping. 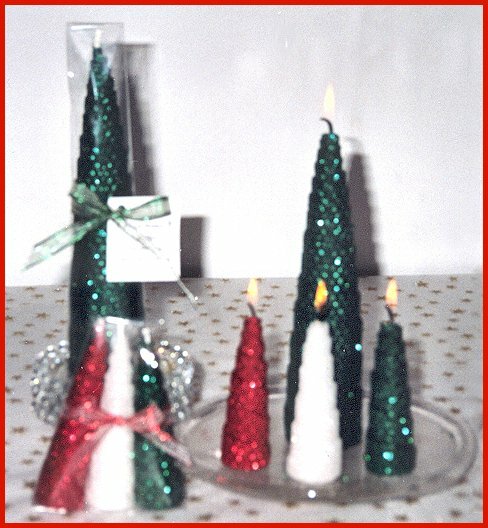 We offer a variety of sizes including pillars, tapers, votives, and Christmas tree candles. All sizes are available in plain or sparkled beeswax.